If you think you know where in the park it is, leave your answer in this entry’s “comments” section. And while we’re at it, those who say that Disneyland doesn’t have a rodent problem can be quickly quieted by with this photo. The vermin seem pretty well settled in here! 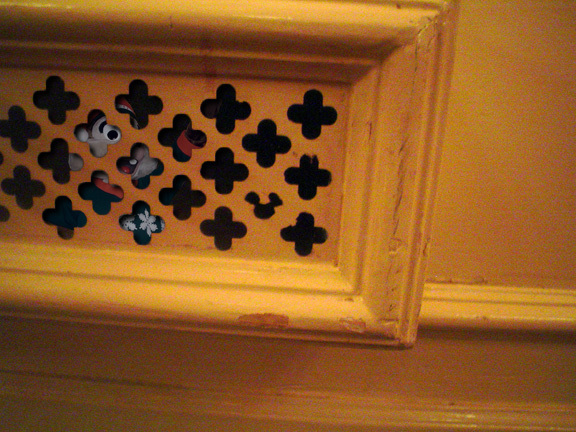 This entry was posted on Monday, June 30th, 2008 at 6:28 am	and is filed under Disneyland, Hidden Mickeys, Photo. You can follow any responses to this entry through the RSS 2.0 feed. You can leave a response, or trackback from your own site. Easy! That is the fourth terminal vent on Car #7 on the ill-fated Rocket Rods. The Hidden Mickey design was repeated on all the cars (you can tell it’s car #7 because of the tooth-marks left on the vent frame by an overzealous child who didn’t meet the minimum height requirement). Unfortunately, the Hidden Mickey design was just enough to prevent adequate exhaust on the Rocket Rods, which (among other things detailed quite thoroughly on this website), led to their frequent malfunction and subsequent removal from Tomorrowland. Also, there is no rodent problem at Disneyland. In 2002, Disney successfully lobbied the State of California to have Chipmunks categorized as a breed of insect. Therefore, Disneyland merely has an insect problem. The Disneyland pest control task force’s current plan to eliminate the pests from the ventilation systems consists of cranking the air conditioning to uncomfortable (and some would say dangerous) levels, but as you can see, the little buggers just throw on some woolies and go about their merry way. Disney has currently filed an injunction to have feral cats defined as a fungus. I think it is in toontown! in the building with the mail boxes that speak when you turn a dial….eh? I knew this one right away, Golden Horseshoe. Gotta love those vents!!! That CAN’T be real! Imaginiers would never make a mickey THAT sloppy! Its obvious you colored over it with the paint app on your computer! 2 points; 1 that donesnt even look like Mickey, 2 if youve seen the picture on this website of a chipmunk acting out of character (which also looks photoshopped by the way) you’ll notice its the same guy, he’s even standing with his left arm extended in the same manner and direction. It is in the Golden Horseshoe vent – center under the stage. Someone put gum or something to mess up that Hidden Mickey. Good news, though. I was there last Friday, and noticed that Disney cleaned it up, so it looks like a normal Hidden Mickey again.